Propane is the third most used fuel globally after gasoline and diesel. Currently, about 190,000 vehicles are powered by propane in the Unites States. Propane, also known as liquefied petroleum gas (LPG) or autogas (when used in vehicles) is a byproduct of natural gas processing and crude oil refining. Propane is odorless, non-toxic, and colorless. At normal pressures and temperatures it is a gas. However, when it is pressurized it becomes a liquid. 97% of the propane consumed in the United States is produced within North America. Environmentally speaking, propane has many benefits similar to natural gas. It is one of the cleanest-burning fossil fuels. The emissions from propane vehicles of carbon monoxide, nitrogen oxide, hydrocarbon, greenhouse gas emissions, and particulate matter are much lower than those from gasoline and diesel vehicles. In fact, propane has 40% lower carbon monoxide emissions than gasoline, which is 64% better than Environmental Protection Agency (EPA) standards. 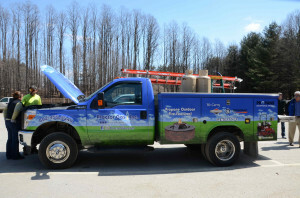 Propane vehicles operate and are similar to petroleum fueled vehicles in regards to their power and speed capabilities. The fuel economy of propane vehicles is slightly lower than traditionally-fueled cars, however the maintenance costs of a propane vehicle are much lower because it burns so cleanly. Furthermore, while propane vehicles can be more expensive than comparable petroleum vehicles, there are many federal tax credits available to offset their extra costs. Applying propane in off-road vehicles is a great investment due to cost and health considerations. Utilizing propane in lawn mowers rather than gasoline or diesel can reduce greenhouse gas emissions by 15% and carbon monoxide emissions by 40%. Additionally, diesel fuel emits dangerous amounts of particulate matter while propane effectively reduces this threat to human health.